LONDON: When Fahad Al-Muwallad fired in the winner that saw Saudi Arabia beat Japan last Tuesday, he not only sent the Green Falcons to next year’s World Cup but also gave a huge boost to the potential brand value of local football clubs. That’s the view of industry insiders who claim there is nothing like a World Cup campaign to get the public not just behind their team, but also more focused on football in general. As part of the country’s Vision 2030 plan, whereby dependence on oil is set to be reduced and the economy diversified, government-owned football clubs are to be put up for sale with profits set to be spent on promoting social well-being and healthy lifestyles. Given the planned privatizations, the timing of the win over Japan — which will see coach Bert van Marwijk’s men set to fly the flag for the country in Russia next summer — could not have come at a better time. “The World Cup is the biggest tournament in sport and attracts an unrivaled level of interest. Strong performances by the Saudi Arabian team will trigger excitement domestically and perhaps more importantly internationally for football in the country,” Finn Dowley, sports analyst at the London-based business consultancy Brand Finance, told Arab News. The Saudi national team has long been one of the most successful in the Middle East and Asia. The Green Falcons have played in the World Cup finals four times and won the Asian Cup three times. But amid the boom in sports finances and growth of football into a megabucks business, Saudi Arabia’s national team has been somewhat sidelined, having last qualified for the World Cup in 2006. Local clubs already have strong and solid support, but given the increased exposure during the World Cup tournament in Russia, could now see a boost ahead of the privatization plans. “It is important to remember that sports clubs in Saudi Arabia include a number of sports — not only the football teams — however, it is fair to say that in terms of core support and fan appeal the football teams are the key assets,” Steve Bainbridge, head of Al Tamimi & Company’s Sports and Events Management practice, told Arab News. The key to making a success of any privatized clubs is to increase commercial revenue, specifically through merchandise and sponsorship. And once again World Cup qualification is predicted to help any plans the new club owners and their commercial teams may have. The model the owners would seek to copy is likely to be, as you would expect, that used by the big European clubs such as Real Madrid, Manchester United and Bayern Munich. “The primary revenue-driver (will be) brand value, which should be maintained, enhanced and leveraged through multiple channels including ticket revenues, merchandise sales, broadcast revenues and club sponsorship, etc.” Bainbridge said. What needs to happen for the Green Falcons to soar into the World Cup? JEDDAH: Arab News has a tradition of covering Hajj “but 2018 was a little different,” its editor-in-chief Faisal J. Abbas said. The newspaper’s focus last year was on the human aspect of Hajj and followed the touching stories of people from around the world. Arab News, the Middle East’s leading English language daily, ran more than 300 news stories on the 2018 Hajj season. These ranged from news stories, investigative reports and features, to exclusive interviews with top Hajj and Umrah ministry officials. All were intended to provide up-to-date coverage of an event considered to be one of the biggest gatherings on Earth. All types of human interest stories were present on its Hajj pages. The newspaper carried the story of Jordanian mother who gave birth to a baby boy at Jabal Al-Rahma Hospital in Arafat. On the other hand there was a suicide at the Grand Mosque that went viral, with fevered online speculation about what happened and who was involved. Arab News was there moments later, a report confirming the incident and giving more details. The paper also launched the 2018 version of its smartphone Hajj app for pilgrims to use. “We planned special coverage to showcase the award-winning redesign of our newspaper and expand online capabilities, including a Facebook partnership and an enhanced Hajj app with our signature tracker, which enables pilgrims to connect with their loved ones back home,” said Abbas. The free app for iOS and Android devices has new and enhanced features, including live news updates. The Makkah-based Muslim World League (MWL) sponsored the Hajj app. The partnership with MWL is part of the body’s global outreach efforts to serve all Muslims. The latest release of the app features several functions for use during Hajj season, including safety features such as an emergency call number and a list of embassies and important service providers during Hajj. New features include a digital Qibla compass, a real-time currency converter, a media gallery, Hajj information and Qur’an prayer audio files. The app also features improvements to the tracker function. The feature, which is optional, allows users who activate it to share their location and follow families and friends in real-time, around the clock. Arab News Jeddah bureau chief and head of the Hajj coverage team, Mohammed Al-Sulami, said the aim of this initiative was to provide a useful and free service for pilgrims on their spiritual journey. “Our mission is to make Arab News more global and more digital, and the Hajj app - thanks to the generous support of the MWL - does just that by providing a live news service and helpful, easy-to-use functions that every pilgrim can benefit from,” he said. The MWL commended the newspaper’s initiative of deploying technology for the public good. “We are happy to renew our partnership with Arab News and our support of this app, which reinforces our position as an umbrella body seeking to serve Muslims worldwide,” the MWL said. Arab News also teamed up with Facebook to put up 360-degree live videos of pilgrims. The Saudi Minister of Hajj and Umrah, Dr. Mohammed Saleh bin Taher Banten, endorsed cooperation efforts between Arab News and Facebook. As almost 2 million people gathered in Makkah for the 2018 Hajj, Arab News and the tech giant cooperated in the transmission of live broadcasts using 360-degree video technology. “We introduced it in 2017 and it was a big success, but we wanted to do something for those who couldn’t make to Hajj this year,” head of Arab News’ digital transformation, Eslam Refaat, said. He added that Arab News believes that technology has even more potential to enhance the annual pilgrimage. Technology has allowed millions worldwide to follow Hajj through the official Arab News-Facebook page. Banten said his ministry was pleased to endorse the cooperation between Arab News and Facebook because it enabled news about the pilgrimage to reach a wider audience. People around the world would be able to see how Hajj was performed, and the “array of services” provided by the Saudi government under the leadership of King Salman and Crown Prince Mohammed bin Salman, he added. “Our endorsement of this cooperation comes out of our ministry’s belief in the importance of utilizing new technology … enabling us to show the world the blessed efforts (in serving pilgrims)." The minister was presented with an official Arab News press jacket, and saw the complimentary umbrellas the newspaper distributed to pilgrims. “We provided pilgrims with extra coverage – literally. Through our corporate responsibility program, we handed out free Arab News umbrellas to shade people from the blazing hot August sun,” Abbas said. He briefed the minister, his deputy Abdul-Fattah bin Sulaiman Mashat, and other members of the ministry about the newspaper’s ongoing digital transformation plan. He said the newspaper’s cooperation with Facebook ensured that Arab News was able to broadcast stories to previously unattainable audiences. Head of regional media partnerships at Facebook, Fares Akkad, said the collaboration followed the success of the live broadcasts of Taraweeh prayers on Arab News’ Facebook page during Ramadan, which he said were very popular. “Hajj is a unique event, and we are aware of its importance to millions around the world. Therefore, we are delighted with this collaboration, which enables more people to participate in this blessed event. These efforts are part of our commitment to regional communication, particularly in Saudi Arabia,” Akkad said. Arab News published a series of special reports from the Kingdom and around the world on Hajj rituals, as well as offering 24-hour coverage through its digital platforms and Pakistan-focused website. It was also keen to reach a wider audience through conducting interviews with famous Muslims who were performing Hajj. 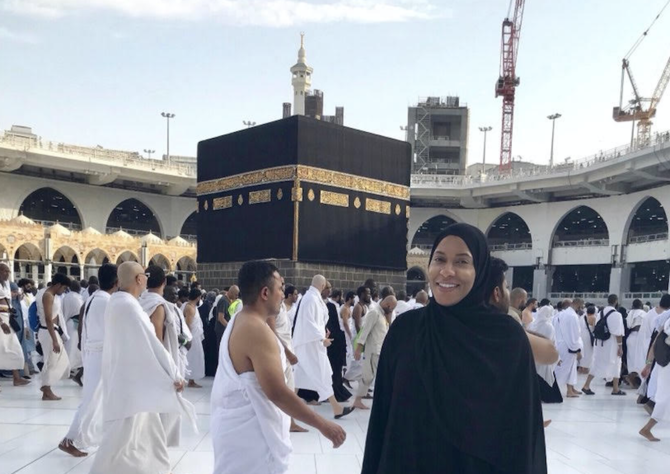 US Olympian Ibtihajj Muhammad, who performed Hajj last year, was among them. It was an experience she would never forget, she told Arab News. The paper was the first media outlet to conduct an exclusive interview with the Hajj minister, who revealed that the holy sites would undergo a significant facelift in the near future. The 55-page book, which sheds light on the efforts made by the Arab News team during its Hajj coverage, has reached diplomats, ministers and prestigious personalities. “This book is an extension of our special Hajj coverage, which we hope would tide you over until we return for the journey next year, when you can count on our team to have even more in store,” said Abbas. The book includes an introduction to Hajj rituals, a glossary, medical tips, statistics about the last seven Hajj seasons and written pieces from reporters who covered Hajj.